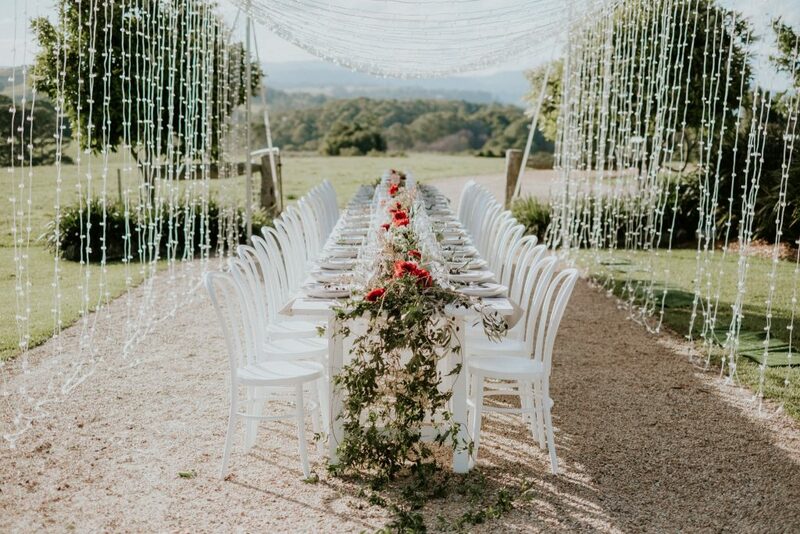 byronviewfarm is undeniably one of Australia’s most luxe wedding venues and as the name suggests, expresses phenomenal views. 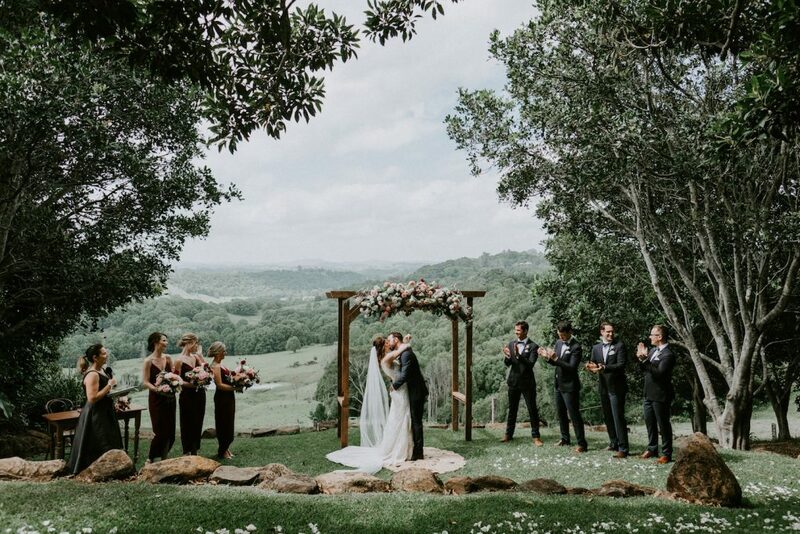 Perched on the highest point of a secluded hilltop, a wedding at byronviewfarm invites you to almost 360 degree uninterrupted views across the hinterland and ocean stretch. Whilst this premium wedding venue is predominately celebrated for its magnificent outlook, it no doubt ticks every other box. From accommodation to discovering the perfect golden sunset – rest assured this property will deliver. Choose from numerous locations for your ceremony to take place, each offering a different perspective and equally stunning backdrop. byronviewfarm’s iconic setting and architectural simplicity compliments any style preference. Lending itself as the central focus is a beautifully landscaped classic white cottage with a spacious, wrap-around verandah that’s perfect for hosting canapés, cocktails at sundown and intimate dinners of up to 80 guests. There are limited dates available per year that allow for larger guest lists to dine under the starry country skies in a clear marquee with a fairy light canopy. Your wedding photos are assured to capture the best natural light in Byron Bay, with a shot of the iconic ‘lone palm’ being one of our favourites. You really won’t need to leave the property to find a stunning photo backdrop, leaving you more time to spend with your loved ones! Once the night is done and dusted, retreat to the fully self-contained, luxurious one bedroom cottage for your ‘pre-honeymoon’. Venue hire includes 1 night accommodation in the cottage the night of the wedding and the use of the grounds for your wedding day. Accommodation check in time is strictly 2pm and check out the following day is 10am. All Elopements & Micro Weddings are planned and coordinated through our sister company Elope. Elopements and Micro Weddings can be booked Sunday to Thursday only. Friday & Saturday bookings will be considered on request (usually accepted if booking is made within 5-months of the wedding day – subject to availability). Dining on the cottage verandah or under the stars – weather permitted. Venue hire includes use of the grounds and 1 night accommodation in the cottage. 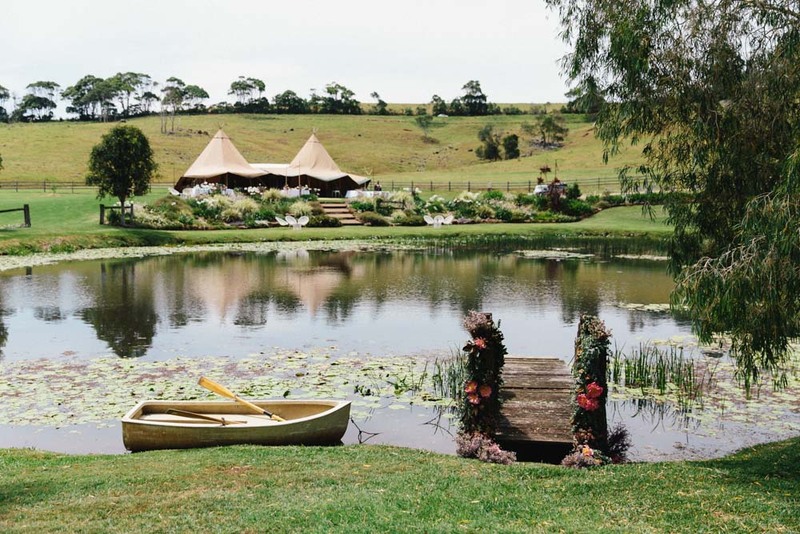 For all receptions over 80 guests a marquee is mandatory and must be hired through Byron Bay Weddings. *Marquee cost not included in pricing. *Only 1 marquee wedding is permitted per month. We offer $1000 off the above prices for bookings in December, January, June & July. *This offer does not apply to Elopements and Micro Weddings of less than 16 people. Catering equipment: The venue is fitted with all wedding catering equipment. Hiring a cool room is however required if there are more than 100 guests. Marquee: For all receptions with 80 – 140 guests a marquee/tipi is required. Toilets:Intimate weddings – 1 unisex bathroom available in the cottage, Up to 80 guests – 1 additional unisex bathroom available in the farmhouse, 80+ guests – hire of additional luxury portaloo is required. byronviewfarm is zoned rural/ residential therefore curfews must be applied. *Two piece bands only. No drums or wind instruments. Live music off after 7pm. DJ or Ipod playlist until 10pm. 1 night accommodation is included in all Venue Hire prices. Additional nights’ accommodation can be booked (when available) at $400 per night. Couples will receive a bottle of bubbles on arrival. Sleeps up to 2 people (up to 4 people can be accommodated the night before the wedding). We suggest couples also book the night before the wedding so they can utilise the cottage for wedding preparations. No early check in requests can be approved until the week of the booking.